Shahrukh Khan poster of the blockbuster Hindi movie Devdas (2002) for sale. This is an actual surviving Bollywood poster of the 2002 Hindi movie directed by Sanjay Leela Bhansali that starred the “King of Bollywood” Shah Rukh Khan in the lead role along with Madhuri Dixit and Aishwarya Rai. Based on Sarat Chandra Chattopadhyay's 1917 novel by the same name, Devdas is the third Hindi film to be made on the subject and the first to be made in color. Devdas was screened at the 2002 Cannes Film Festival and won a staggering five National Awards and ten Filmfare Awards, tying with Dilwale Dulhania Le Jayenge for the most Filmfare Awards won by a single film. Shah Rukh Khan, Madhuri Dixit and Aishwarya Rai all won Filmfare Awards for their stellar performances in the film. At the time of its release, Devdas was the most expensive Bollywood film ever produced. It was nominated for the BAFTA Award for Best Foreign Language Film and was also India's submission for the Academy Award for Best Foreign Language Film. Devdas was also listed in “The 100 Best Films Of World Cinema” in 2010 by Empire magazine. Time Magazine selected Devdas as the best movie released in 2002 (worldwide) and subsequently also included it in its prestigious top 10 movies of the millennium worldwide, making this Devdas movie poster highly collectible! Printed and circulated a few years after the first release of the film, this Devdas poster was originally designed for publicity of the film but never ended up being used. 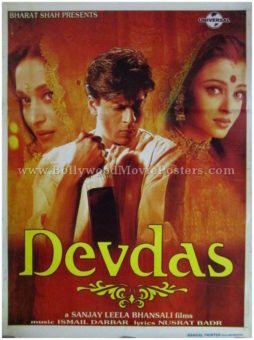 Superstar Shahrukh Khan is seen at the center of this Devdas movie poster flanked by Madhuri Dixit and Aishwarya Rai on either side. The film's central character Devdas (Shah Rukh Khan), who essays the role of a wealthy law graduate (who later descends into alcoholism when his parents oppose his decision to marry his love interest) is seen at the center of this Devdas poster clutching a bottle. He is flanked by the object of his affection, Paro (Aishwarya Rai) and the woman he turns to for solace, prostitute Chandramukhi (Madhuri Dixit Nene). The soundtrack of the film became a rage throughout the nation. Songs from the film such as “Maar Daala” and “Dola Re Dola” are played till today as well as watched on video for their stunning dance performances.